Devoted to the exploration of the deep ocean, specializing in underwater navigation, search analysis, and at-sea operations. Amelia Earhart disappeared without a trace over the Central Pacific in 1937 while attempting an around the world flight. More than eighty years have passed, but the famous flyer, businesswoman, feminist, writer, and adventurer remains a popular figure. Her disappearance is the greatest aviation mystery of the 20th Century. Dave Jourdan addresses crowd of nearly 400 at National Geographic’s Grosvenor Auditorium in Washington, D.C. The National Geographic Society has long been fan of Amelia, and awarded her the Society’s Special Medal in 1932. The Society has followed expeditions and supported investigations into her disappearance over the years. 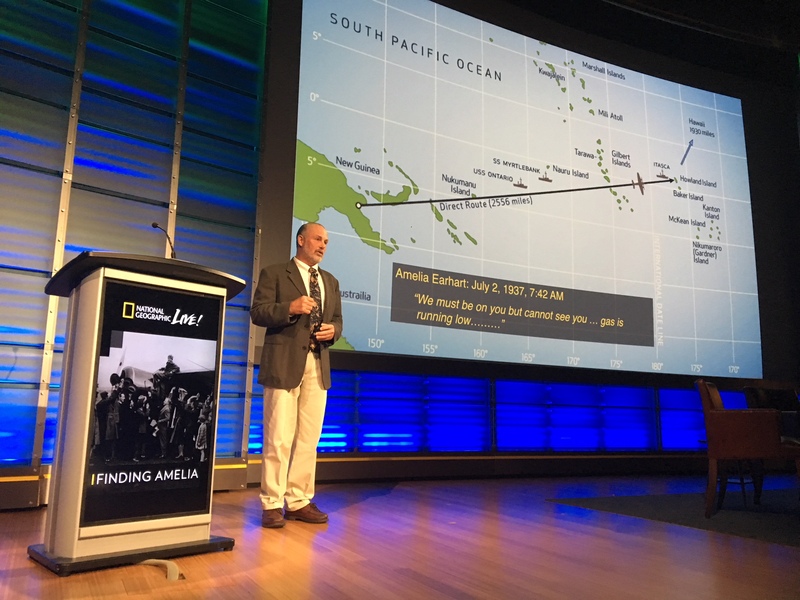 Last week, National Geographic invited Dave Jourdan to speak at the Grosvenor Auditorium in Washington, D.C. about the quest to find Earhart’s Lockheed Electra plane in the Pacific near Howland Island. Dave has led three Nauticos expeditions to the area over the last fifteen years seeking the aircraft, thought to be resting at depths of 18,000 feet. A crowd of nearly 400 assembled for the talk, which also included speakers who discussed alternative theories about her demise. President of the Society, Gary Knell, led off the proceedings, and Senior Program Officer Dr. Aurora Elmore moderated the event. A panel discussion and audience Q&A rounded out the evening. Several members of past Earhart search expeditions were in attendance. The Never Forgotten series chronicles Nauticos ocean explorations and discoveries, remembering and honoring lost heroes and explorers. Has Amelia Earhart Really Been Found?